Showtime has announced the production team for its revival of the Twin Peaks TV series. Expected in 2017, the cast of Twin Peaks, officially announced yesterday, includes: Kyle MacLachlan, Sherilyn Fenn, Sheryl Lee, Laura Dern, Naomi Watts, Eddie Vedder, Jay R. Ferguson, Jim Belushi, Michael Cera, and Monica Bellucci. See the full cast list. As with the Twin Peaks cast announcement, the production team member list features many names attached to the original Twin Peaks, which ran for two seasons on ABC, before being cancelled in 1991. Production team members joining David Lynch on the revival include Mark Frost, Sabrina S. Sutherland, Scott Cameron, John Sclimenti, Tommy Klines, and Steve Itano. Here is the list, from Showtime. 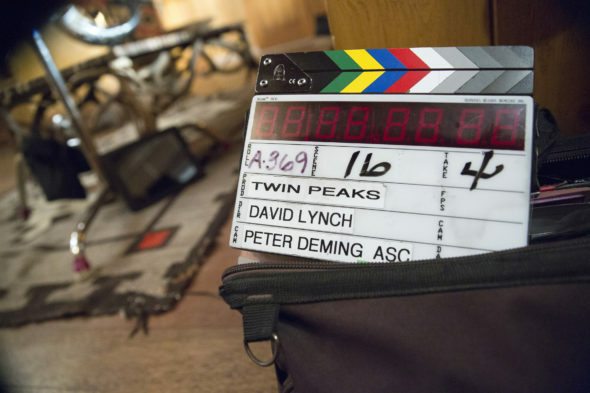 LOS ANGELES, CA – April 26, 2016 – On the heels of yesterday’s announcement of the new TWIN PEAKS cast and the conclusion of principal photography, SHOWTIME, David Lynch and Mark Frost have released the names of the production team on the highly-anticipated series. Several members of the TWIN PEAKS team are longtime Lynch collaborators who also worked on the original television phenomenon. Written and produced by series creators and executive producers David Lynch and Mark Frost, the new TWIN PEAKS is directed entirely by David Lynch, and will premiere on SHOWTIME in 2017, on-air, on demand and over the internet. One of the most groundbreaking and influential television series of all time, the new SHOWTIME event series picks up twenty-five years after the inhabitants of a quaint northwestern town were stunned when their homecoming queen Laura Palmer was shockingly murdered. PAINT GANGBOSS ROBERT PEREZ JR.
BEST BOY RIGGING GRIP KEVIN ENRIGHT, JR.
MAKE-UP EFFECTS CAREY JONES, KNB EFX GROUP Inc.
SET DRESSER R. GREGG SZABO JR.
What do you think? Are you a fan of the original Twin Peaks TV show? Do you plan to watch Showtime’s Twin Peaks revival? More about: Twin Peaks (2017), Twin Peaks (2017): canceled or renewed?